Since 1998, StoryBook Theater has introduced young children in the Puget Sound area to live theater with original, interactive musicals written especially for 3-10 year olds and their families. StoryBook Theater shows are hilarious, 55-minute musicals filled with music, laughter, whimsical costumes and quirky characters, guaranteed to delight the entire family. StoryBook Theater was founded in 1998 with very specific goals in mind – first and foremost, to introduce very young audiences to the magic and wonder of live musical theater. 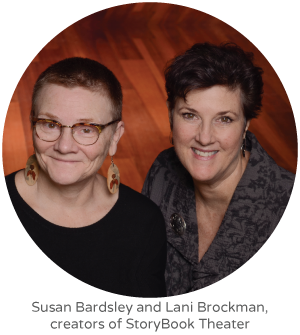 To meet that goal we, Lani Brockman and Susan Bardsley, (with the creative collaboration of our talented professional actors) write 55-minute musicals aimed specifically at the 3 to 10-year-old, while not forgetting the parents, grandparents and teachers who bring them to the theater. Our shows are enjoyed by children and adults alike! We combine beautiful, bright costumes with our gorgeous “storybook” sets, then add them to songs, dances and clever, updated fairy tales, to produce musicals for young audiences and their families. An important value that we integrate into every performance is audience participation. StoryBook characters ask questions of the audience and expect answers! StoryBook Theater audiences sing and dance! StoryBook Theater audiences sometimes have chase scenes happen right among them! StoryBook audience members occasionally help us on stage! The creators of StoryBook Theater also believe in including life lessons in our shows. Cinderella learns (and teaches) not to judge someone by his or her outside. The 3 Pigs learn about cooperation and working together. The Emperor learns that his new clothes are not as important as who is inside those new clothes. We believe in fairness and treating others with respect and carefully try to fill our shows with those messages. All in all, StoryBook Theater is a short, fun, enriching experience for families and school groups; and you can’t beat our ticket prices! Join us for a fabulous and fun theater experience!